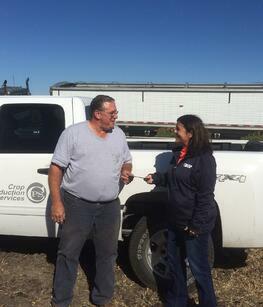 Our other winner was grower Jerry Huffman of Greene Farm Management in Dunlap, Illinois. Jerry is a customer of the CPS location at Onarga, Illinois, and was awarded an iPad for attending "How to Make Your Fall Fertilizer Dollars Go Farther," a webinar focused on how to maximize the efficiency of fall dry fertilizer applications, particularly by incorporating Titan XC into the application. 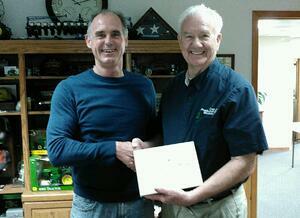 Jerry is pictured here receiving his iPad from Glenn Mogged of the CPS branch in Onarga. A big "thank you" to Carey, Jerry and all of those who attended our webinars this year! Stay tuned for upcoming webinars by signing up for updates from Agricen.